Next is Lizzy-bear. She was quite fearful when we first met her, but now loves to greet us at the fence and have her head scratched. 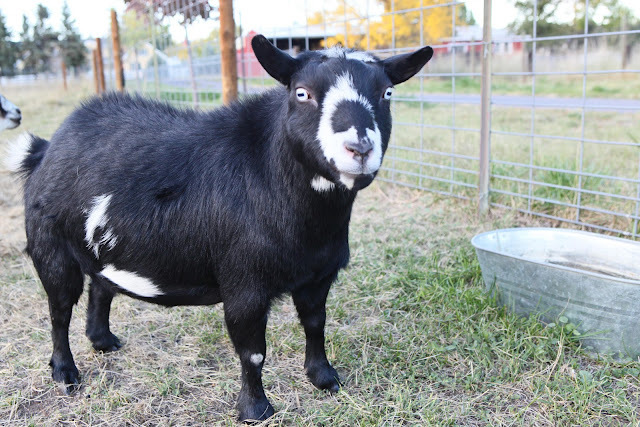 She's dressed up as a cow for Halloween (actually, that's how she looks all year long--a goat in cow's clothing). Lastly, we have Popcorn (aka Big Pappa). 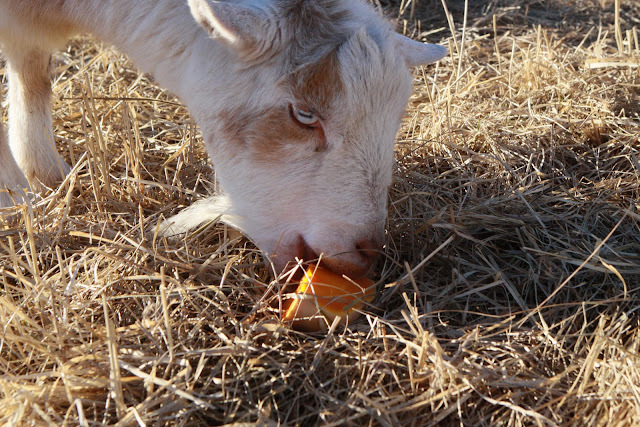 He's the only male left (a wether), and is a sucker for all kinds of treats. Apples are his favorite. He suffers a bit from "the grass is always greener" syndrome, as you often see him stretching his neck as far as possible through the holes in the fence to reach a particular kind of purple flowering weed on the other side. Apparently the ones just outside his reach on the other side of the fence are far superior to the exact same weed growing in his pasture. I wonder why that is? 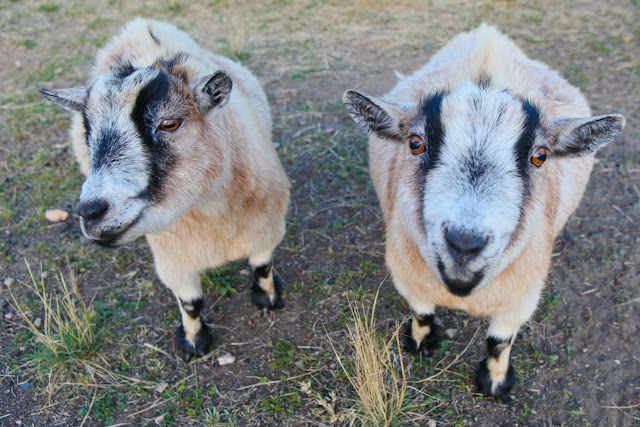 Those are some cute Pygmy goats.. Mine love pumpkins too... Everyone here loves pumpkin and it is great for all... I also have several animals who just will not keep their heads on the right side of the fence - I think it is genetic because I have generations of the same blood line do this while other bloodlines never do it. 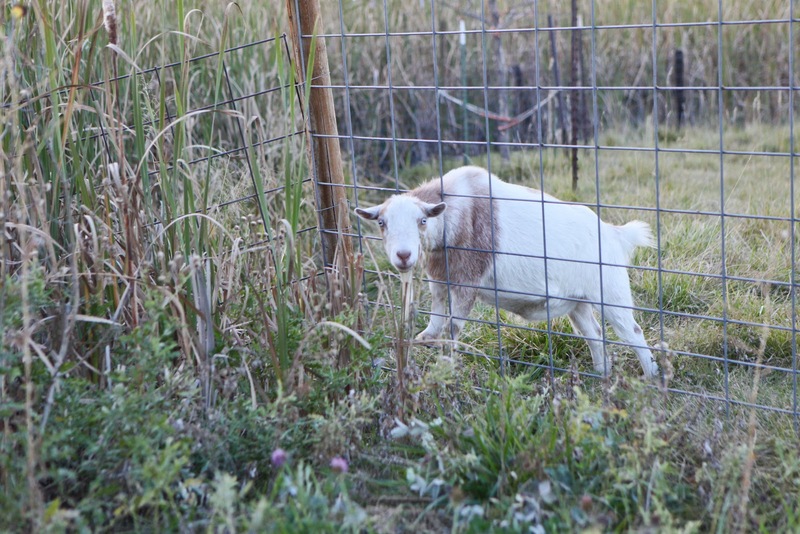 It also is not an issue of seeing it being done because other's never follow the behavior of the fence problem goats. Strange but true. That is very interesting, and come to think of it, none of our other goats do that either! They are all so cute! I'd have to say Lizzy-bear is the cutest to my eyes. 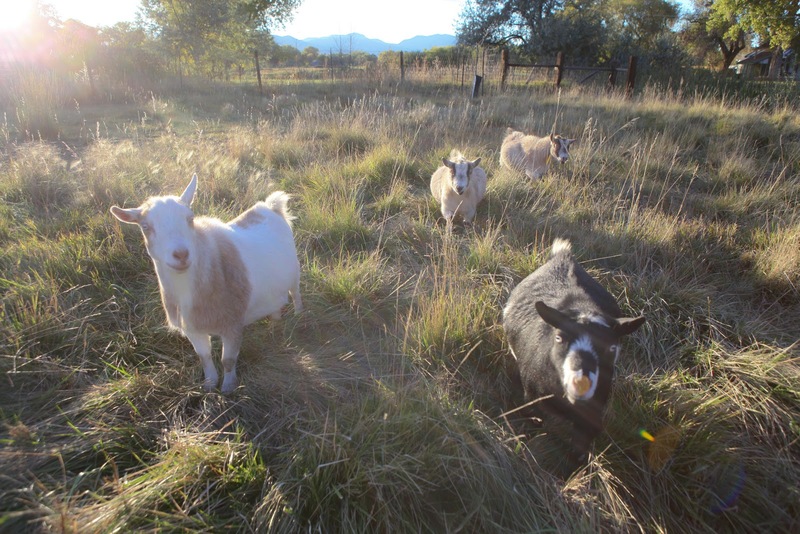 Goats are a lot of fun (and a bit of fun trouble!). I hope to have some of my own someday. Cute photos. I hope you have a delightful day!